Learn how to compete in international markets! The nature of business has changed, and Global Marketing Co-Operation and Networks explains how and why former competitors are now joining forces. Exploring co-operation, networks, and internationalization, this collection provides you with an indispensable framework for grasping the ongoing changes in global business. In addition, it includes a new, broad-based theory of international entrepreneurship that will help you master the intricacies of global marketing. Global Marketing Co-Operation and Networks features both empirical research and conceptual studies. It provides you with important research findings about the impact of internationalization on entrepreneurs, smaller firms, and multinational giants. This valuable book contains up-to-date information from top researchers in entrepreneurship from Canada, the United States, the United Kingdom, Australia, New Zealand, and Singapore. 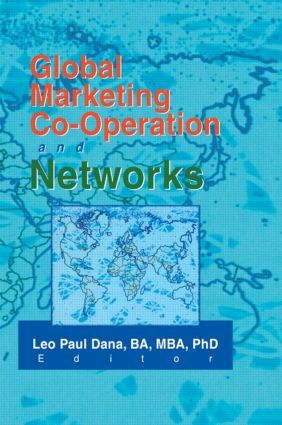 Global Marketing Co-Operation and Networks is an essential resource for executives and entrepreneurs hoping to break into international business, as well as students and researchers interested in international economics, globalization, networking, and marketing strategies.